Originally from Union Bridge, Maryland, Adrian is a second-year graduate student working on his Ph.D. in Computer Science. Adrian is also the founder of ShiftyBits, LLC, a company which was just awarded a National Cancer Institutes (NCI) research contract to work on analyzing breast histology images. 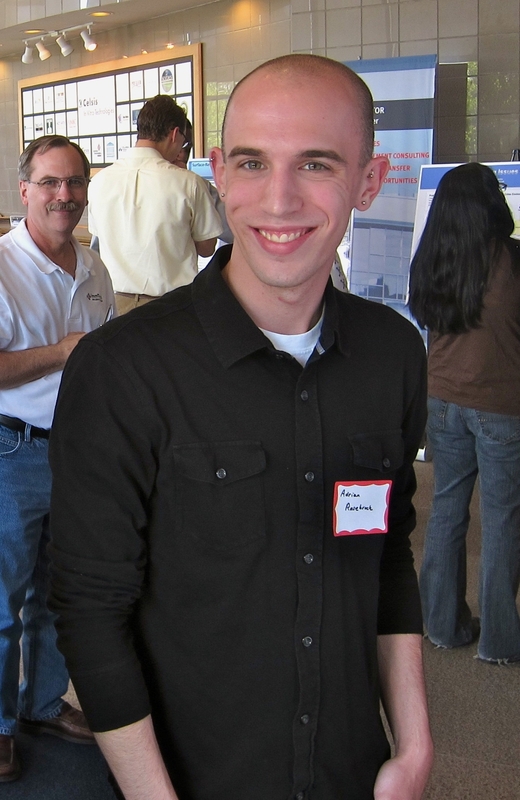 When he's not studying, Adrian works on building his business and enjoys travel and concerts. I knew very early in high school that I wanted to be a Computer Science major. My parents bought me my first laptop in the summer following middle school. Shortly after, I started teaching myself basic programming. From there it was pretty much inevitable that I would major in Computer Science. My thesis is on the automatic identification of prescription drugs within images. Given an image with a pill in it, I am developing algorithms to automatically extract the pill from the image, describe it in terms of shape, imprint, and color, and then automatically identify the pill. What inspired you to start ShiftyBits, LLC? I have always been interested in starting my own company. I have been working with startups ever since I was a freshman in college. I thrived off the energy and it motivated me to start my own company. A lot of people ask where I came up with the name “ShiftyBits”. It actually started as a joke three years back. One day, a friend was debugging a particularly troublesome piece of code. He asked me to take a look at it for him so I leaned over, stared at the screen for a minute, and then very seriously (but sarcastically) said “Did you try shifting the bits?” When I was trying to think of a company name I remembered that moment and thought that it would work. ShiftyBits was recently awarded a research contract from the National Cancer Institutes (NCI). What do you hope to accomplish with your research? My contract with NCI involves automatically analyzing breast histology images; specifically, the terminal duct lobular units (TDLUs), the functional units in the breast in which most breast cancers arise. These analyzations will contribute to developing standardized measurements of the TDLUs that will aide researchers in detecting breast cancer. Some of the analyzations include identifying acini within TDLUs, counting the number of acini within TDLUs, assessing the diameter and area of each acini in TDLUs, etc. Once we have methods to automatically extract these measures we can start applying machine learning techniques to detect breast cancer in histology images at very early stages. I always have multiple projects going on. It makes me feel alive. I thrive on building projects, especially within startups. Besides working on graduate work and the NCI contract, I also serve as the senior web developer and online strategist for RateMyTeachers.com. I also have recently launced ChicEngine.com, a fashion image search engine. I have only had one internship. When I was seventeen, I worked for Jos. A. Bank as web developer for a summer. It was a really good job to have as a seventeen-year-old, and I still carry those experiences with me today. My after graduation, plans are going to start much earlier than the day I receive my Ph.D. At least nine months to a year prior I will start contacting companies that I would like to work for, sending them my portfolio, asking them for interviews, etc. Whoever has the most interesting job is the one I will take, but who knows where that will be. I still have two years left in the program, a lot can and will change in that time period. My dream job is continuing what I am doing: running my own company in the computer vision and machine learning field, only at a much higher and grander level. I love small business, I love startups, I love the excitement, I love the drive to build, the energy in the eyes of the people around you. It is intoxicating and it makes you feel alive. As long as I can continue to do those types of things, I will be happy. I chose UMBC because of its strong Computer Science program. My first impression of UMBC was on orientation day, walking from the administrative garage, past the RAC, the administration building, and Academic IV. I remember walking underneath the canopy of trees, feeling calm, relaxed, like the atmosphere suited me very well. I was a transfer student, so my first class at UMBC was actually CMSC 202 with Mr. Frey. CMSC 691: Computational Photography. I started to become interested in computer vision during my senior year in high school, but at that point I did not have even close to enough education to understand all the mathematics behind it. It actually was not until three years later when I took Computational Photography that things finally started to click. CMSC 678: Machine Learning. By far I would recommend this class to anyone in the Computer Science department. In almost all areas of computer science, machine learning can be applied to solve some sort of problem. It is applicable almost anywhere. By taking machine learning during my first year as a graduate student, all my other classes became that much easier. CMSC 691: Data Mining. The Data Mining course I took with Dr. Kargupta furthered my knowledge of machine learning, providing me with more insight and mathematical justification for the algorithms that were touched on in Machine Learning. I like that all the professors are interested in helping their students. Above all, I think that is the most important of my education here. 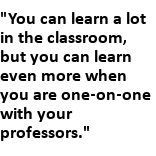 You can learn a lot in the classroom, but you can learn even more when you are one-on-one with your professors. I would describe the professors in the department as approachable. As I mentioned above, all of them are willing to help, to talk to you about whatever problem you are working on. Furthermore, the UMBC computer science department spans a broad range of areas, ensuring that you can always find someone to talk to, regardless of what project you are working on. My first piece of advice to incoming graduate students is to take the Machine Learning class as early as possible. It made my studies much easier and gave me an understanding that I can apply to almost any problem. My second piece of advice is to play with your little pet projects, the projects you build in your free time. They are fun, they relieve stress, and even if they never turn into a full-blown product, you will have gained some valuable experience. What advice would you give to prospective entrepreneurs? Bootstrap. Spend as little as possible. 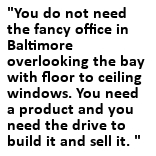 You do not need the fancy office in Baltimore overlooking the bay with floor to ceiling windows. You need a product and you need the drive to build it and sell it. The nice office and other perks will eventually come, but they are by no means something you need from the start. Save that money and use it for your product. The second most important piece of advice I can give to entrepreneurs, especially those in the computer science field, is not to get too caught up in “over-coding”. By “over-coding” I simply mean following every object-oriented pattern and scalability recommendation to the letter. The whole point as an entrepreneur is to move fast, to prove your product. There is no reason why you should be wasting time writing lots of interfaces, abstract class definitions, or spend hours trying to optimize a single method. I am not saying that you should be sloppy with your implementation, but you should be free to cut corners in the beginning. Prove your concept first, prove that it is worth your time and your (and maybe your investors’) money. Once your concept is proven, then go back and refactor it — that is the time in which you can focus on ensuring the product is scalable. You might have the most scalable algorithm in the world but if you are only getting a few users a day using the product, your efforts were for nothing. Code smart. But be a realist.